He’s a saintly name very much in vogue in recent decades. 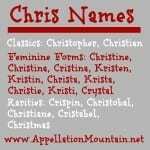 With a happy birthday to my husband, our Baby Name of the Day is a family name from his side: Christopher. Christopher’s meaning is heavy – literally. The -topher come from the Greek pherein – to carry. Christopher carries Christ. It’s an obvious reference to keeping the faith, but it also ties to a famous legend. There are plenty of pictures of Saint Christopher carrying the child Jesus across a river, and we know that he’s the patron saint of travelers. But there’s much more to his story. According to the Golden Legend, that thirteenth century bestseller, Christopher was born Reprobus, a burly fellow of the doubting variety. Reprobus’ only goal was to serve the biggest, baddest ruler in the all the land. For a while he served a king, before shifting his allegiance to a bandit who claimed to be in league with the devil himself. But the bandit – vile as he was – still feared God. And so Reprobus bumbled towards the straight and narrow. A hermit suggested he help pilgrims cross a treacherous river, and so he did. Eventually a child approached Reprobus. As they forded the river, the child grew heavy, leaden. By the time they safely reached the other shore, Reprobus was exhausted from his burden, and told the child that he’d nearly dragged them both down. This is the punchline, of course – the child revealed that he was Christ in disguise, and that Reprobus had carried the very weight of humanity across the river. Reprobus took the name Christopher in commemoration, and went off to evangelize others, eventually running afoul of another king and ending his life a martyr. Was he real? Maybe. 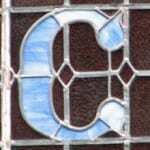 What we know is that the name has remained in use over the centuries. At one point, it must have been as overtly religious as Neveah. By the later twentieth century, he’d become such a well-established, mainstream pick that there’s no reason to assume parents who choose this name are focused on the meaning. Three kings of Denmark, one of whom ruled Norway and Sweden, too, in the 1400s. The explorer Columbus – born Cristoforo in Genoa, sailing under the flag of Spain, in 1492. Had he not died young, the playwright Marlowe might have rivaled Shakespeare himself. Architect Christopher Wren designed many a landmark, including Saint Paul’s Cathedral in London, completed in 1710. Then there’s Christopher Robin, the name of author A.A. Milne’s son, and the inspiration for Winnie-the-Pooh’s chum. Whether it was the bear or the meaning or some other factor, Christopher caught on, charting in the US Top Ten from 1967 through 2009, holding the #2 spot for many years from the 70s into the 90s. Many of those boys probably answered to Chris. A few might be Kip or Kit, as in Saint Kitts, the island. And a handful are Topher, like actor Topher Grace. Speaking of actors, Walken, Reeve, Meroni, Knight of Brady Bunch fame are fellow actors. There’s director Christopher Nolan and plenty of other notables. Add it up, and Christopher is a handsome classic with a long history of use. And with an unexpected nickname, like Topher or Kit, he might even feel fresh in 2014. I’m a Christopher – born in the mid 60s. My Chinese wife calls me Kit (because she couldn’t pronounce Christopher), and I really like it. I first encountered “Kit” for Christopher in E.E. “Doc” Smith’s Children of the Lens book from 1947, I think. Main character’s name was Christopher Kinnesin and they called him Kit. I love Christopher too! It’s the name of my 11-year-old grandson. His dad (my son) calls him “Sto”. Happy birthday to your husband! I’m married to a Christophe – that was the #1 most popular name in France the year he was born. He mostly goes by Chris these days, but apparently his nickname as a toddler was Kiki. I love Christopher! Had this baby been a boy, Christopher was our chosen middle. It’s just a little too much like my own name for us to use as a first. Christopher is all Christopher Robin and Colonel Christopher Brandon from Austen’s Sense and Sensibility to me. It is handsome, stoic, and romantic, while still being warm and comfortable. I definitely prefer it in full, too.